The Fellowship was fortunate enough to obtain a copy of EMPIRE: UPRISING #1 from IDW Publishing. Mark Waid and Barry Kitson are the storytellers, and Chris Sotomayor colors. The empire that Golgoth built is now three years old. On the anniversary of his daughter’s death, the Empire shows its respect with three minutes of silence, on pain of death. A group of rebels has chosen to attack Golgoth at this time, but without success. Golgoth’s reign is strict and quick to punish, so there are always those who would end it. But he’s powerful, and no one knows what it will take to bring him down. Ten years later, Waid and Kitson are finally getting back into the world of Empire. And it’s a fascinating idea – what if the bad guys won? A supervillain has taken over the world, destroying anyone who could possibly stop him. Where does that world go from there? I don’t want to spoil the story, but it’s got some really cool possibilities. And the art is sensational, with all of the horror you’d expect from a world like this. Oh, all of the wonderful questions this issue raises. I can’t even begin to list them (and I’m not sure I want Golgoth to lose yet, either). It’s going to be a fun ride either way. 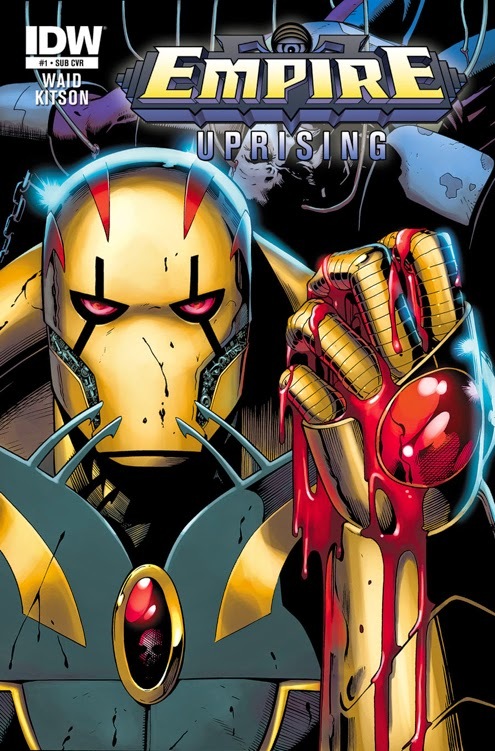 EMPIRE: UPRISING #1 is available now at your FLCS or at idwpublishing.com.